Norman French served as the source of hunting and allied terms in 14th century England. During the era, young gentlemen learned the "Le Art de Venerie" with its fanciful array of hunting terms consciously developed as an expression of courtly fashion. The Normans indeed provided English with the phrase "vn soundre de porks" to designate a group of swine, in addition to many other terms of venery. Though "sounder" dates from no later than 1410, it yet persists in English. Modern French, however, now prefers "une réunion de porcs." It is important to note that different terms of venery (namely, drift or drove) apply to domestic pigs (Sus scrofa domesticus or Sus domesticus). "What is a sounder of swine great or small? Think what I say: my son night and day." 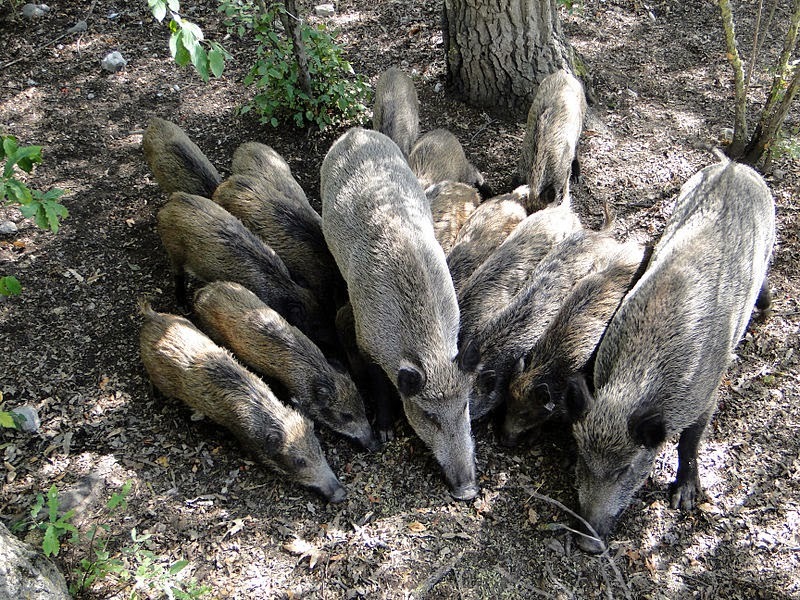 Though the distinction among the different sorts of sounders is not much observed these days, the better works of reference still define a sounder as 12 or more boar. One is left with the question, what is group of fewer than 12 to be called? John Hodgkin writing in his seminal work on the subject for the Transactions of the Philological Society (1908) notes that the number 12 was not universally accepted, and that other authorities put the minimum number necessary for a sounder at five or six. As noted above, modern sources, to the extent they make a numerical distinction at all, place the lower limit at 12. Adding to this confusion, Hodgkin quotes Randle Holme writing in his Academy of Armory and Blazon (1688) who believed that the lower limit of 12 applied equally to various synonyms for sounder, to include herd, score and singular. This is in error, at least with regard to herd. The Book of St. Albans provides the general term "herd" for "all manner of deer," a term which at the time simply meant "animal." Dame Berners places no other restrictions on the use of the term, nor do modern sources. Score, significantly, has no Internet presence. A singular is he so: for alone he will go. All the same, the editors at the Oxford University Press do not numerically limit the use of "singular" with regard to boar. Internet occurrences of the term reach nearly 3,000. The use of sounder online, however, is nearly four times as high. Our language is left even at this late date with sounder for groups of 12 or more, herd for smaller groups or those of unknown number, and singular, whatever the size of the group, to accentuate the solitary nature of this beast. No doubt the practice of counting members of the genus Sus is well-engrained from a young age. The practice should continue uninterrupted. These should not be confused with what are called peccaries or javelinas in English, and among other names, jabalíes americanos in Spanish.